Petar Stoyanov was born May 25th, 1952, in the city of Plovdiv. He gradiuated from the Law Faculty of the Sofia University St Kliment Ohridski. 1992 - Deputy Minister of Justice, in the government of the Union of the Democratic Forces, with Philip Dimitrov as PM. May 1993 - Chairman of the Legal Council of the Union of the Democratic Forces. 1994 - MP of the 37th National Assembly. Deputy Chairman of the parliamentary group of the Union of the Democratic Forces. Deputy Chairman of the Commission of Youth, Sports and Tourism. 1995 - Deputy Chairman of the Union of the Democratic Forces, responsible for the Internal Affairs. June 1st, 1996 - He won the preliminary presidential electoins, with 66% of 870 000, as the presidential candidate of the Union of the Democratic Forces. 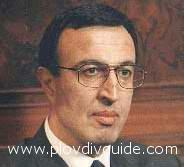 November 2nd, 1996 - Elected the President of Republic of Bulgaria, with 2 507 517 votes (59.73%). Jan.19th, 1997 - He swore as a President of the Republic. Jan.22nd, 1997 - He took office as a President. Speaks German. Married, with a son and a daughter.